Keeping in mind the precise demands of clients, we offer a wide range of Aluminum Wire Scrap. These are engineered using top quality components and by implementing best available technologies. One can avail these products in various range and specifications following the exact demands and requirements. Aluminium scrap wire purity minimum 99.7%.Minimum order 20 MT. We are trading in the finest quality Copper Cable Wire Scraps, which are recycled for producing pure copper products and equipments. We are procuring these scraps in bulk quantities to meet the large demand of clients. Also we make sure that our product passes through stringent quality check programs and the finest quality of product is delivered to our customers world wide. We could supply the copper wire scrap quality and competitive price. 1) Our copper scrap includes wires, tubes, and plates, etc. 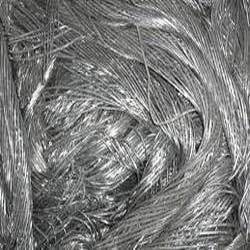 These presented Copper Wire Scrap are superior in working and offered to the customers as per their convenience. Durable in nature, these scraps are made very precisely under the guidance of professionals. Best in quality, these scraps are lighter in weight and supplied to the customers in many sizes and shapes. We are offering Copper Wire Scrap. 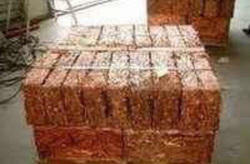 Copper wire scrap, (Millberry) 99.99% at a purity of 99.78% min. 99.78%Max. It consists of No.1 bare, uncoated, unalloyed copper wire. Not smaller than No.16 B and S wire gauge. Green copper wire and hydraulically compacted material to be subject to agreement between buyer and seller. We can offer a huge gamut of Aluminum Wire Scraps to our clients. Our offered Aluminum Wire Scraps is widely appreciated by our clients which are situated all round the nation. Owing to its high utility, corrosion resistance and high tensile strength, this scrap is widely demanded in the market. We offer Aluminum Wire Scraps at most affordable prices. Minimum Order Quantity should be 10 Ton.